Hello Lovely Studio. When Life Gives You Lemons, Make Limoncello! Easy Instructions and Photos as well as Recipe for How to Make Italian Limoncello. 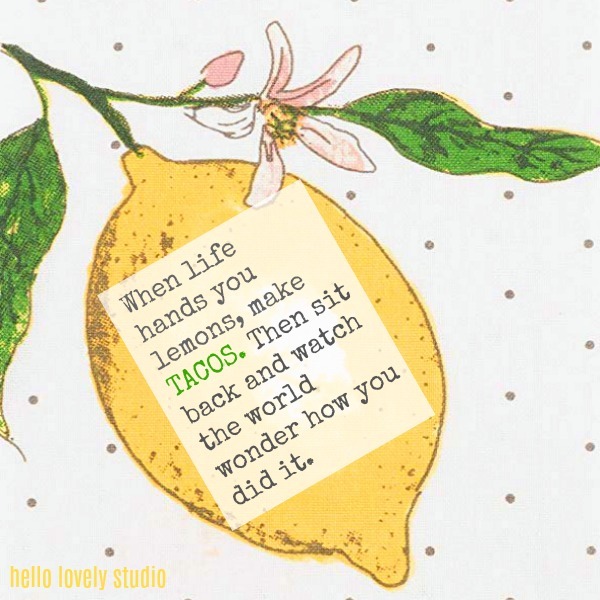 Lemon Themed Kitchen Finds, Meyer Lemon Loveliness, and Personal Reflections About Sour and Sweet…certainly lovely indeed. If lemony goodness tempts your tastebuds, here is food for thought. Are lemons not your favorite jam? Read on as well. As with so many of the musings from this sanctuary of peaceful interiors (literal and figurative), mysteries hide within mysteries. Beauty may be more than citrus skin deep. Unexpected lovely may linger between the lemons and even the white space between words. But first the limoncello recipe! 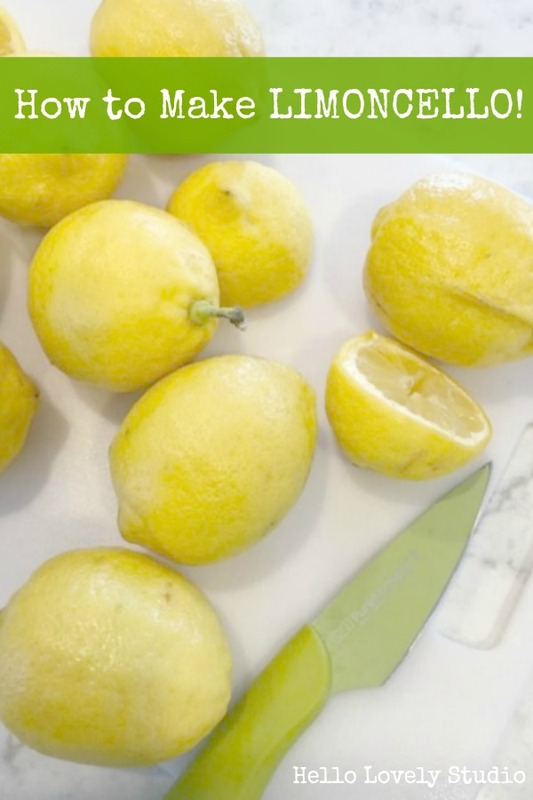 8-12 lemons: scrub them clean then peel them with a vegetable peeler or knife, avoiding the pith. 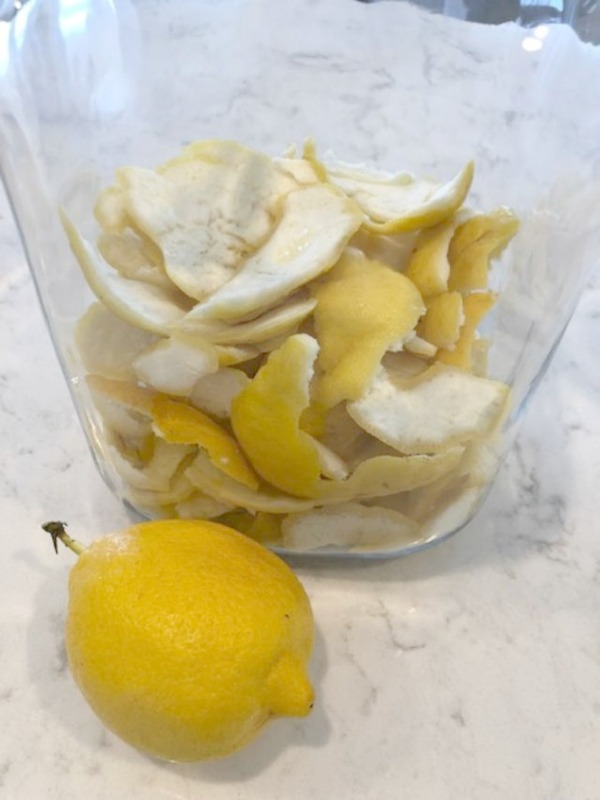 Place peels in a clear glass jar that can be sealed. 750 ml vodka or Everclear (about 3 cups): pour over lemon peel in jar and store in a dark place, 2-4 weeks. Strain the infused liqueur through cheesecloth into a clean container. If desired, gather peels into a piece of cheesecloth and squeeze any remaining liquid into container. Discard peels. 3 cups water: bring it to a boil in a saucepan, then add 2 cups white sugar. Reduce heat and allow a few minutes for sugar to completely dissolve so you are left with a thin syrup. Cool completely before adding to alcohol. Stir to combine. You may now bottle your limoncello in sterile bottles and store in the freezer. Serve limoncello ice cold in cognac or shot glasses. There are so many delicious ways to use limoncello for pasta dishes and more. GO HERE where I have gathered some yummy ideas for you to pin and discover. Hello Lovely Studio. When Life Gives You Lemons, Make Limoncello! Easy Instructions and Photos as well as Recipe for How to Make Italian Limoncello. Lemon Themed Kitchen Finds, Meyer Lemon Loveliness, and Personal Reflections About Sour and Sweet…certainly lovely indeed. Buy this bowl HERE. This bowl (above and below) is always on my counter with fruit and makes the perfect gift! What color should limoncello be? Sometimes limoncello is clear – it was likely sweetened with a simple syrup rather than honey, which imparts an amber hue to the limoncello. 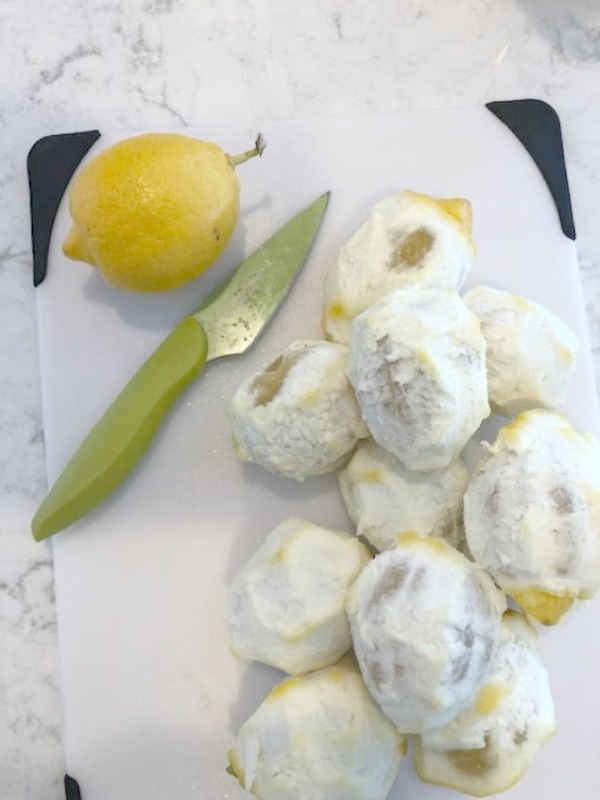 What if there is white on my lemon peels? Limoncello makers frequently caution us about careful avoidance of the lemon’s pith when peeling (since the white is the bitter part of the fruit). But even when I’m lazy and get some pith in there, it doesn’t create a big problem. (Translation: I like this recipe because I can be lazy.) Remember, you’ll be adding sweetener to the lemony infused alcohol. 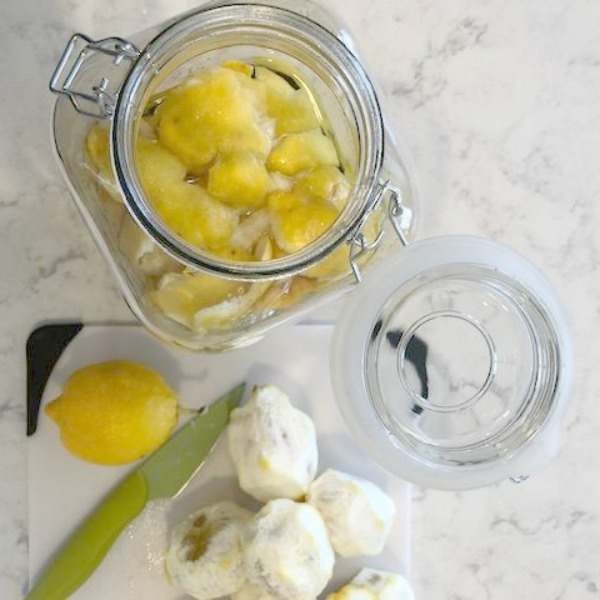 Don’t you juice the lemons for limoncello? Some folks juice the lemons after peeling and add this to the jar with the alcohol. I haven’t done so yet. Sometimes I make lemonade with the juice right away. For this batch, I froze the peeled lemons for later use as stuffing for a roast chicken. 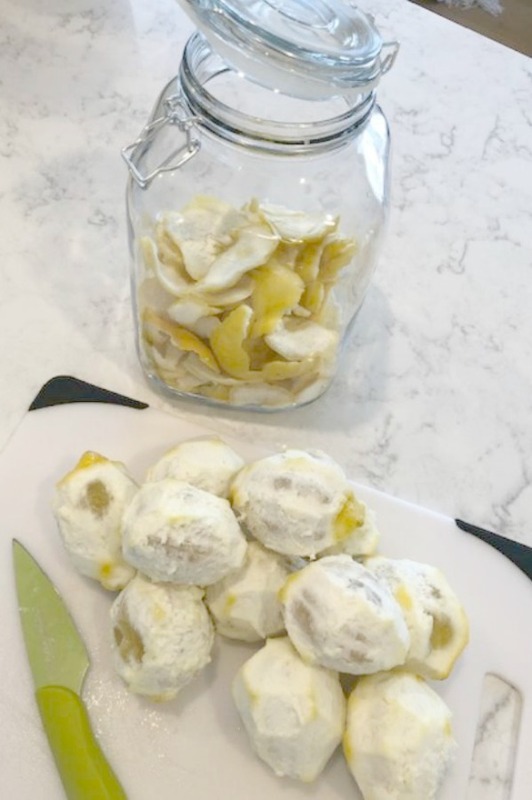 You can also take frozen slices out of the freezer to combine with other fruit and herbs for a yummy clean smelling potpourri on the stovetop to infuse your kitchen with fresh fragrance. Hello Lovely Studio. Shop my kitchen RIGHT HERE. When Life Gives You Lemons, Make Limoncello! Easy Instructions and Photos as well as Recipe for How to Make Italian Limoncello. 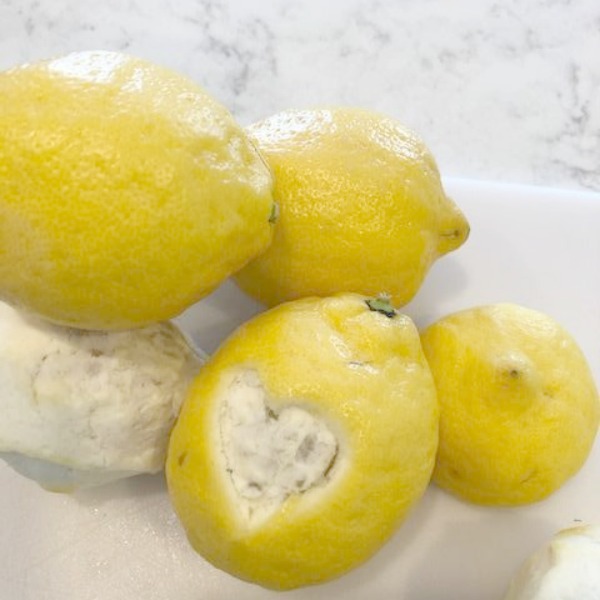 Lemon Themed Kitchen Finds, Meyer Lemon Loveliness, and Personal Reflections About Sour and Sweet…certainly lovely indeed. 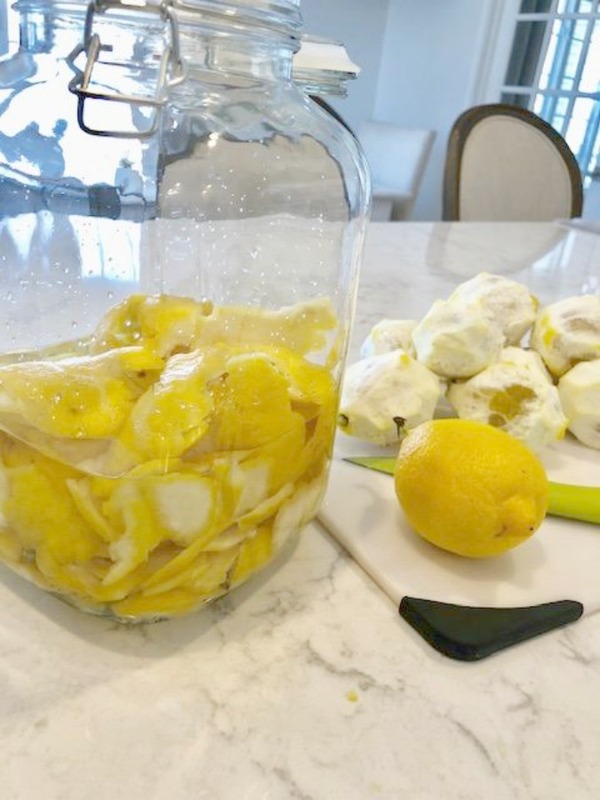 How much time will the lemon peels marinate? Everyone has an opinion about aging and how long to let the lemon peel and alcohol hang out. In my experience, 2 weeks is plenty of time. One week is even probably okay. How should I serve the limoncello? I love this tip for serving limoncello at a gathering: cut a paper milk carton in half and use the bottom half for this preparation. Place a bottle of limoncello in the center of the carton, fill with water (and herbs if desired), and freeze until ready to serve. Peel away the cardboard. Now your limoncello will stay ice cold at the table in its own confetti pretty cube of ice. Can the limoncello be used in baking? Can you even imagine how your poundcake or lemon blueberry loaf can be kicked up a notch with a little boozy help from homemade limoncello? Remember those jello cakes we used to make in the 1970s? How about pricking little holes with a fork into your pound cake while still warm and drizzling some room temp limoncello into those wee indentations? Another idea is to simply combine a Tablespoon or so of limoncello with powdered sugar for a glaze for a cake or muffins. 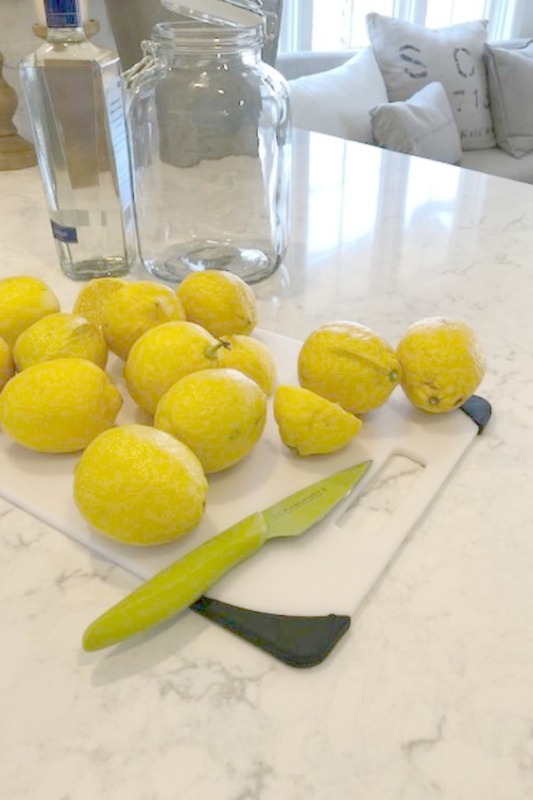 How to Make Limoncello: Great Tutorial! My own life has been awfully lemony since June. Plenty of consolations, but also a steady supply of lemons. Many lemons have been new and unfamiliar. (No need for worry or pity–I’m doing the work, and I live emboldened by prayer and held in grace.) Though I struggle with illness, with stress, and with real problems (‘real’ meaning issues one can’t simply throw money at to make them disappear), my spirit and soul remain stronger than any struggle. While I may not know the sour you may be facing today, friend, I honor your battle and know this: it need not get the last word with so much sweetness hidden nearby. It’s only right I confess something straight away before rambling on about lemonade. I am not very fond of clichés and all those overused phrases cross-stitched on embroidery hoops and tattooed on a fair share of ankles. The ‘make lemonade’ cliché has persisted since the early 20th century in American culture wherever references arise to optimism and overcoming fate. I can imagine how meaningful and rich the saying was in its infancy. In spite of my personal distaste for phrases gone stale and cliché (clearly I’m a classic enneagram 4 word nerd), God has shockingly nudged me toward them. As a younger woman, the cliché triggered both eye rolls and resistance. Yet invitations to drink down what I anticipate will be bland or bitter kept arriving. Maybe it’s an acquired taste which seasons the second half of life. Hello Lovely Studio. Our countertops are Viatera Minuet quartz: read about it HERE. When Life Gives You Lemons, Make Limoncello! Easy Instructions and Photos as well as Recipe for How to Make Italian Limoncello. Lemon Themed Kitchen Finds, Meyer Lemon Loveliness, and Personal Reflections About Sour and Sweet…certainly lovely indeed. Where the beauty in this mystery lies for me, is how miraculous it feels when a cliché like ‘make lemonade’ or ‘bloom where you’re planted’ is etched upon my heart while I sleep or in a sober moment of awakening. I can’t prove it. But it becomes crystal clear that the message’s sweetness HAILS FROM SOMETHING BEYOND ME AND MY INFLATED EGO. It seems my whole life through, I have been wired for words in a love affair with language. Yet God somehow speaks to me clearly in pared down, ordinary, and elegant simplicity. Noticing the sweetness and profundity within the mystery of the cliché has transformed my regard for: the commonplace, the seemingly unoriginal, and those expressions repeated a million times which typically shift us quickly into boredom-mode. Hello Lovely Studio. 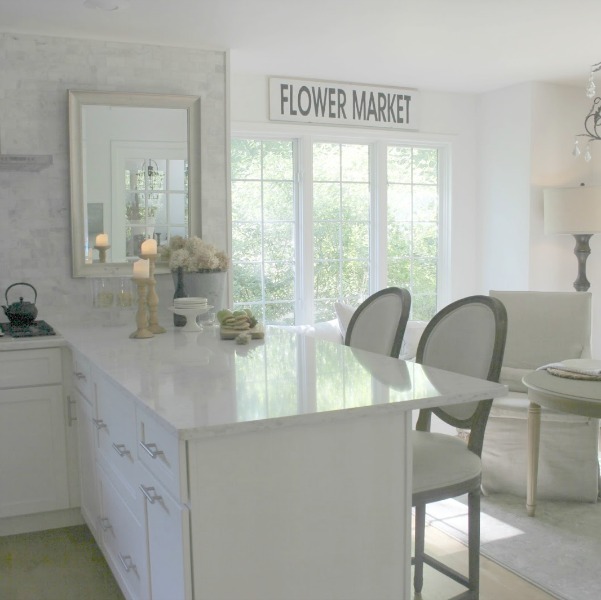 Read about our quartz countertops RIGHT HERE. When Life Gives You Lemons, Make Limoncello! Easy Instructions and Photos as well as Recipe for How to Make Italian Limoncello. 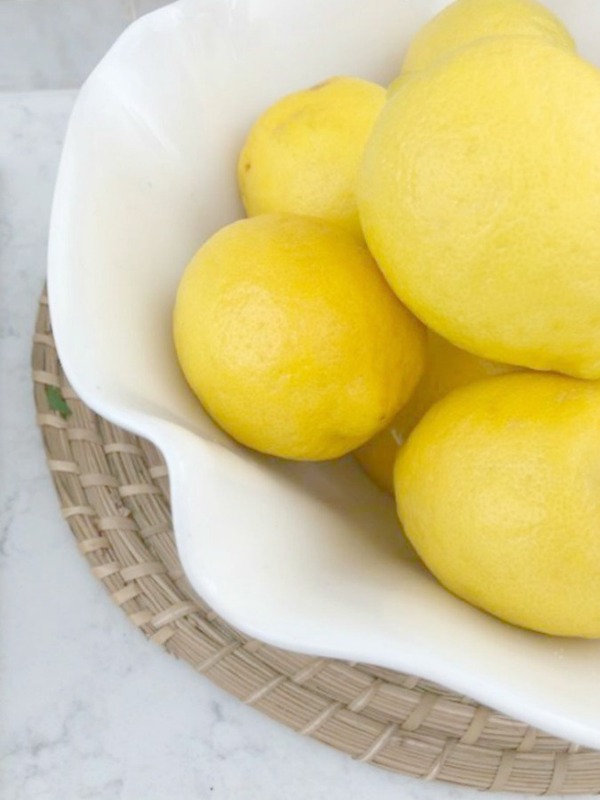 Lemon Themed Kitchen Finds, Meyer Lemon Loveliness, and Personal Reflections About Sour and Sweet…certainly lovely indeed. It would seem that on this journey which is my own, the cliché points to a secret simple pathway of sweetness. While I would prefer the pathway be level or an ascent, in this upside down kingdom, treasure seems to lie in the descent. Descent into deeper humility; descent into a more humble reliance upon grace. I’m not special. While we’re all so different, I believe the universe, God, LOVE, and Mystery speak with expressions precisely and perfectly designed to woo us into greater sweetness. 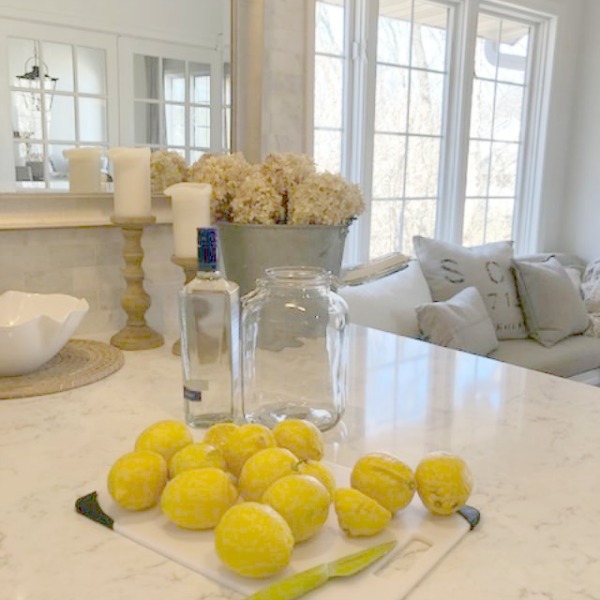 My kitchen is bland without those lemons! Shop my kitchen RIGHT HERE. Hello Lovely Studio. Are we too rushed, defensive, and busy to notice? Solitude, silence, and stillness have been masterful teachers guiding my own attentiveness and shaping my heart. I highly recommend their wisdom to you. Thank you for reading this with such tenderness, friends. 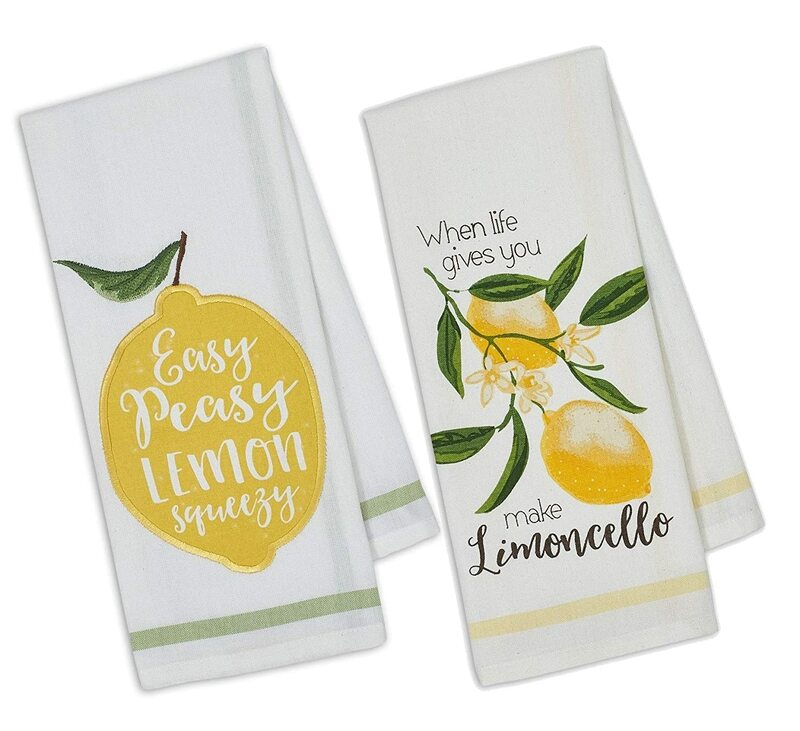 Sweet Lemony Finds You’ll Love! Yellow always feels so welcome and natural when spring arrives, and I loved curating these cheerful finds to lift and charm your everyday. If there is a single lemony addition you make to your life this very instant, THIS SHOULD BE IT. Meyer Lemon yum! I have used these products for decades now, and their fresh scent and loveliness never fail to elevate mundane kitchen chores. Who doesn’t want to look and feel their best? And who can’t use more creative ideas to work superfoods into the daily diet? Want to create childhood wonder, encouragement to splash in rain puddles, and even upgrade the style factor of your porch or entry? Wellies! 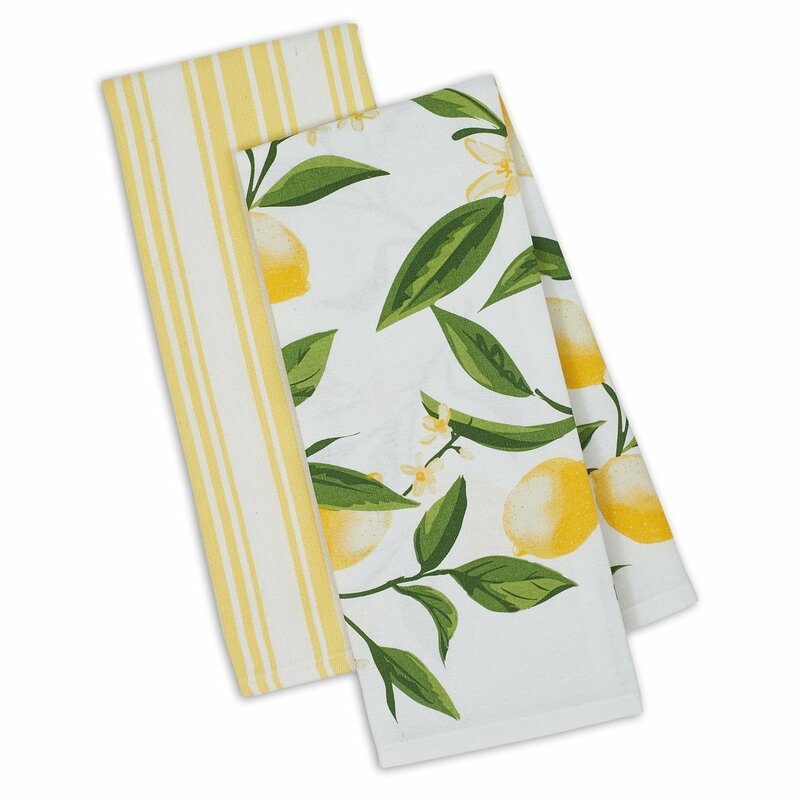 If you were alive in the 1970’s, this sweet design on the charming dishtowel below may tug at your heartstrings! Keep on truckin? Oh my soul, I haven’t seen that in print for a long time, and it triggers a ton of memories! 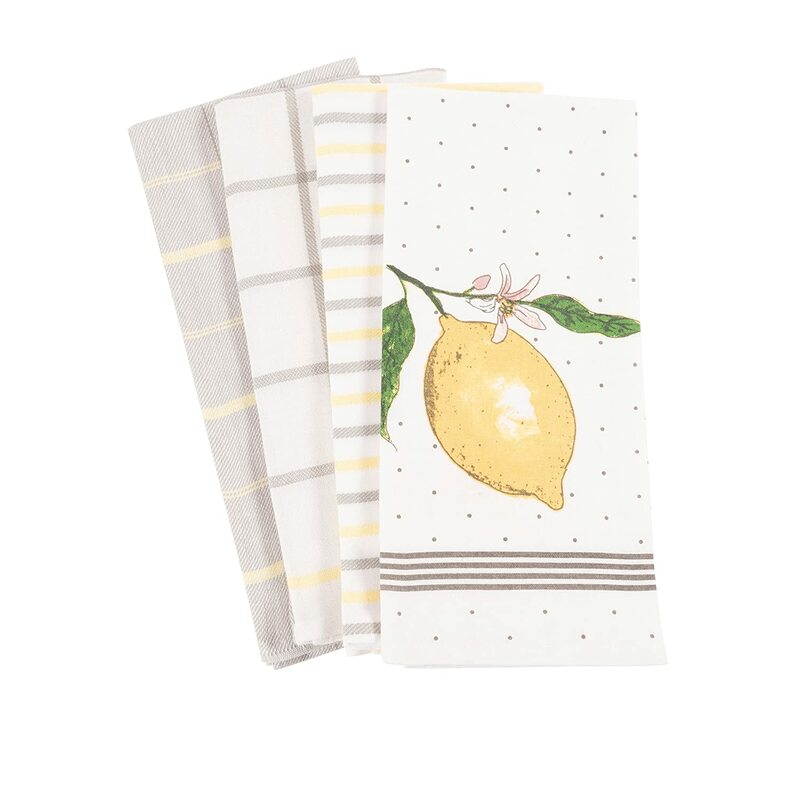 Guess I can’t hide my fondness for dishtowels. They can add just the right pop in spring. Aren’t these plates on sale elegant? 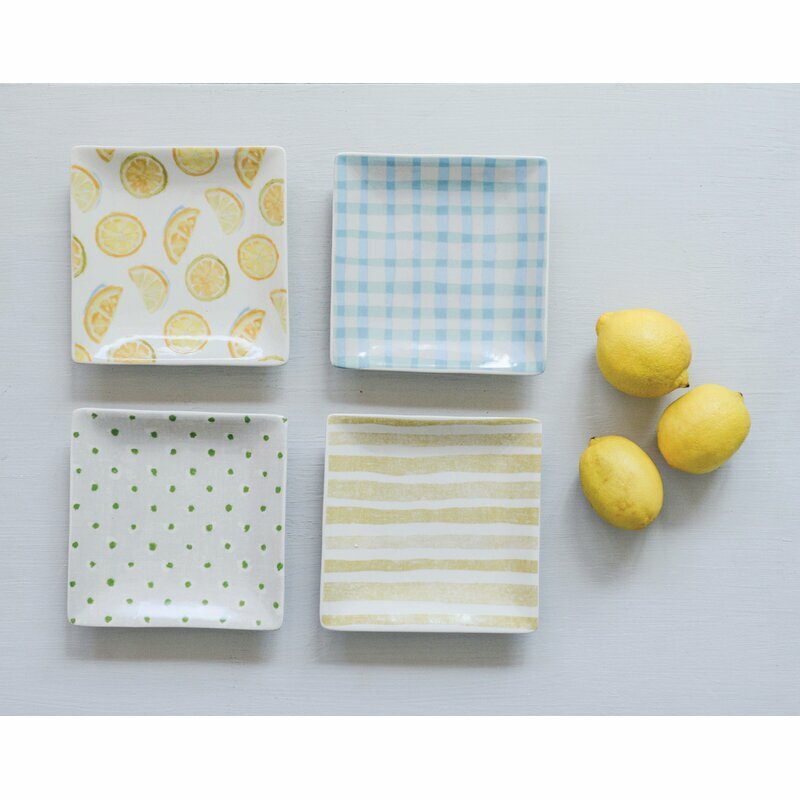 I am imagining these snack plates with little grapes and berries–what a mood lifter! 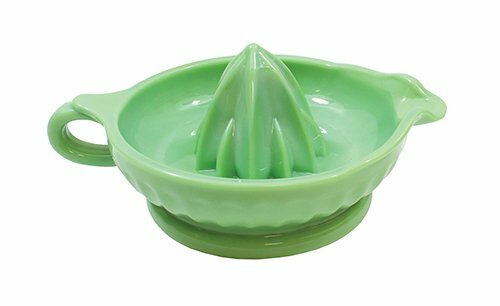 I used to have a vintage Jadeite juicer quite similar to this one. Brings back sweet memories. Isn’t it amazing that you can find anything at all now online!?! Thanks so much for tasting, for seeing, and for dreaming with me on this journey. PLEASE CLICK HERE TO PIN THIS POST to spread the lemon joy. 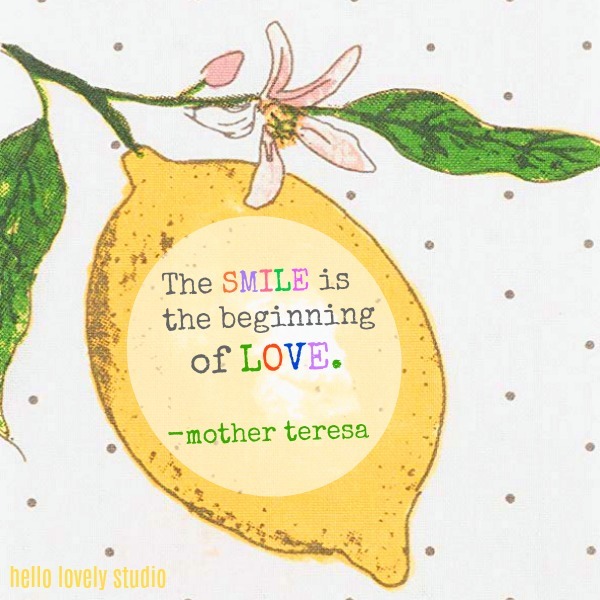 Wishing you loads of lemon sunshine, smiles for miles, and the luxuriant warmth of spring. If you’re in the mood for a little more spring color, SEE THIS! Previous Post Tour a Charming Saltbox Style Tiny House! Oh, friend, what a blessing to feel truly heard. Thank you for your heart. Wishing you peace. I needed this post today as a reminder, to slow down, listen and put it all in God’s hands. My shoulders and neck hurt, my teeth from grinding and I am tired from no sleep. Thank you my friend for being a messenger and a bright light. t wait to try it. Spring is in the air here too and I am loving it. It does make you smile. 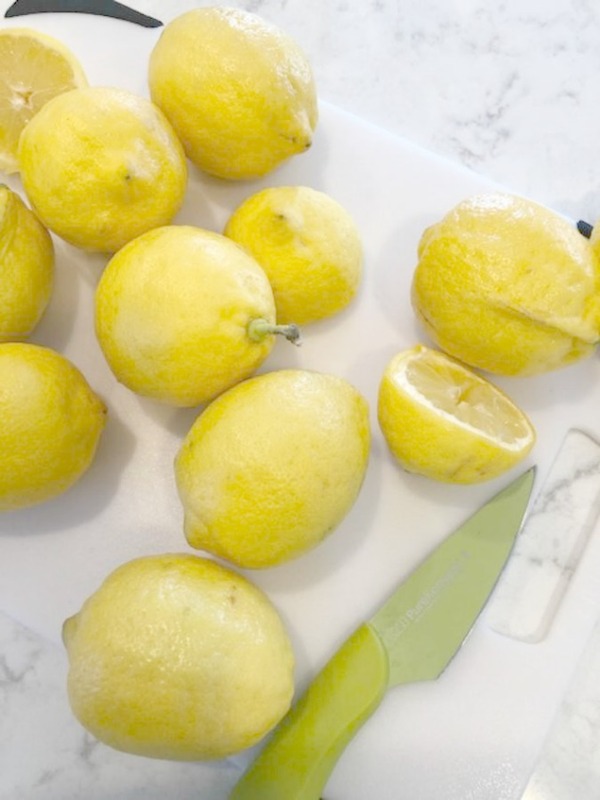 Oh my goodness…all of this lemony, sunshiny fun, I love it all! Those yellow hunter boots though! I really enjoy your beautiful blog Michele, thanks for inspiring!